It was a bittersweet moment for all of them. They met crying and wailing and enveloped each other in the tightest hugs, only to be pulled apart 11 hours later. 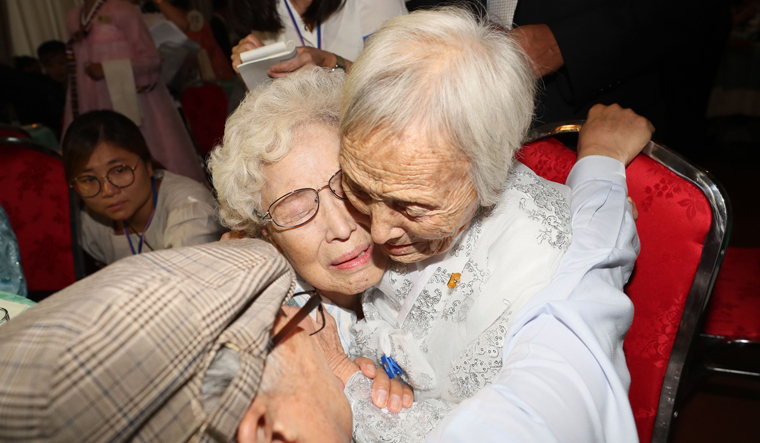 The 90 families torn apart for more than six decades by the Korean war were reunited in the North on Monday. The first in three years, the reunions were a result of thawing relations between the two Koreas and were held at Mount Kumgang, a tourist resort in North Korea. North Korean leader Kim Jong Un and South Korean President Moon Jae-in agreed to the latest round of reunions during their first summit in April. About 330 South Koreans from 89 families, many of them in wheelchairs, gathered with 185 lost relatives from the North, embracing with tears, joy and disbelief. Some were struggling to recognise family they have not seen in more than 60 years. Kim Gyong Sil and Gyong Yong, 72 and 71, wearing light violet traditional dress of hanbok, stood nervously staring at the entrance before their 99-year-old mother Han Shin-ja turned up. They could not speak for minutes, wailing loudly and rubbed their cheeks and hands. “When I fled home in the war,” said Han, failing to continue as she choked up with emotions, a Reuters report said. Millions of people were swept apart by the 1950-53 Korean War, which separated brothers and sisters, parents and children and husbands and wives. Hostilities ceased with an armistice rather than a peace treaty, leaving the two Koreas technically still at war and the peninsula split by the impenetrable Demilitarized Zone (DMZ), with all direct civilian exchanges—even mundane family news—banned. More than 57,000 South Korean survivors have registered for the brief family reunion which often ends in painful farewells. The separated families are victims of a decades-long political gridlock between the neighbours, which has escalated over the past several years as Pyongyang rapidly advanced its weapons programmes. "I also brought 20 stainless spoons," he added. "I bought everything because it's my last time." Some of those selected for this year's reunions dropped out after learning that their parents or siblings had died and that they could only meet more distant relatives whom they had never seen before. For years, Seoul has been calling for regular meetings between separated families including using video conferences, but the reunion programmes often fell victim to fragile relations with Pyongyang. Starting Thursday, there will be a meeting of another 88 groups of relatives, 469 from the South and 128 from the North, according to Seoul’s Unification Ministry. The brief family reunions, which began in 1985, can be a traumatic experience for the aging survivors, they say. And time is running out, with many of them aged 80 or older. Around 132,600 individuals are listed as separated families as of end-July. Of the 57,000 survivors, 41.2 per cent are in their 80s and 21.4 per cent are in their 90s, according to government data. Many of the family members brought gifts for their North Korean relatives. Socks, underwear, basic winter jackets, medicine, toothpastes and food are the most common items, with gifts deemed too extravagant unlikely to pass muster with Pyongyang authorities. “I’ve prepared for him some household medicine including digester and headache pills, nutritional supplements as well as some daily necessaries,” Lee Soo-nam, a 76-year-old South Korean, told Reuters before meeting his older brother in the North separated by the war.